Nigerian breads, such as chin chin, are fried in oil. 2 What Is the Difference Between a Bagel & a Donut? Bread is eaten with every meal in Nigerian cuisine. The proper recipe for any bread, and the best bread to eat, are often the subject of good-natured arguments. 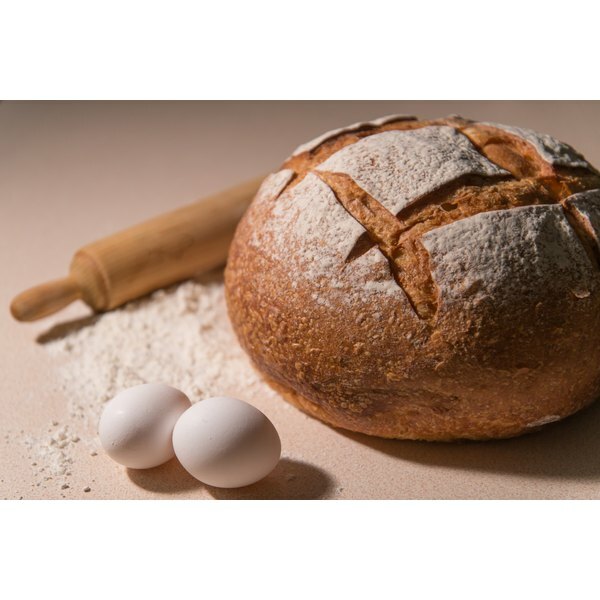 Oyo bread is favored by some, while thousands of loaves of the sweet, heavy agege bread are sold each day throughout Nigeria, especially in the capital city of Lagos, notes the the Aylesbury Estate Kaleidoscope Project website. Puff puff is fried balls of dough eaten as a snack. Chin chin, which is Nigerian bread that is fried, is sweetened with sugar and eaten as a snack. Combine the dry ingredients -- flour, sugar and baking powder -- in a large bowl and mix the ingredients well using a sifter or other utensil. Add the butter, egg, milk and water to the dry ingredients and fold mixture using your hands to work the dough until the ingredients are well-mixed. Sprinkle a flat surface or cutting board lightly with flour and use a rolling pin to roll out about a third to a half of the dough mixture. The rolled out dough should be about ½-inch thick. Cut the dough, using a knife or other cutter, into 1/2-by-1/2-inch squares. Heat about ½-inch of oil in a heavy skillet or sauté pan over medium heat. The oil should be hot, but not smoking. Place a few pieces of the chin chin in the hot oil and fry them until they are crisp and golden-brown. Remove the chin chin from the oil and place them on paper towels to drain the excess oil. Roll out more dough, cut the dough into pieces and fry the pieces until the all of the dough is cooked.